Becoming a cloud computing professional is no easy thing these days. Despite a large number of opportunities available, very few people are able to secure a good job because of the high demands. The cloud computing jobs are well paid although you are expected to have experience of about 2-5 years before a good one can come your way. Organizations are always searching for expert employees to have in their company and if you want to have a good cloud computing job in the future, then this post will surely help. 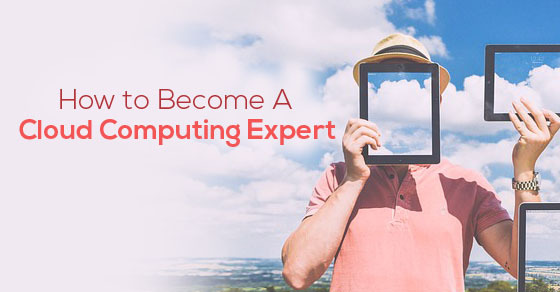 In this article, you will get to learn about how you can become a cloud computing expert at ease! The word cloud computing is almost everywhere. It could be a difficult term to understand but in this post, it is going to be super easy. Cloud computing meaning here is accessing data, storing it along with the other programs all over the net instead of using a hard drive. The cloud is also just a metaphor for the net. It goes back to those days of presentations and flowcharts that would not just represent the gigantic server farm infrastructure of the net as nothing apart from a white and puffy cloud that accepts connections and doles out information as it floats. The following mentioned are a few skills that are required in a cloud computing model. Though the type and the extent of those skills will have to depend on the presence on how much of the cloud shall be built and managed in house, there is simply no question that technical skills are must when it comes to cloud computing concepts. This knowledge base will also have to focus most heavily on the current capabilities of the internet. The framework of Java and .NET could come directly to the forefront along with the knowledge of virtualization. Having good knowledge on some of the tools and languages here will be required as well. It is also important to have good skills when it comes to project management. Now, this could have become a necessity for a period of time, especially when it comes to those IT projects which will need marshalling people and a whole section of resources which include establishing important timelines, meeting goals within the deadline and working towards helping the enterprise agree on these goals. Linux tends to hold a very large section of cloud computing service so you have to be familiar with one. It will give you a huge head start which will bring more customers to your company. The first step here is to set up all your computers to dual boot with the help of an operating system that is preferred. After that, you will begin learning. Here you will find out the five important rules of Linux, learn all the interesting demands, work with the alternatives etc. It is also crucial to become familiar with the operating system. DevOps, also known to some of us as development operations is a method of development that will take the entire system of software lifecycle into account. Whether it comes to planning or usage and maintenance, you must remember that this is quite popular in the field of cloud computing. You have to understand what this is and how you can fit into it and how it may help you. You may also begin by learning about these developing operations and read several articles so that you have a good and better idea on Microsoft and Linux. There are many companies which store and use information on a regular basis. You have to work with them manually, handle projects on a day to day basis and what not. Developers who have the ability to automate the tasks and processes are very much value as they can improve the efficiency of every company’s interactions with the data. Even though automation is a vague term, you can always gain more skills in this area and learn about both puppet and chef in an easy manner. Puppet labs give you a huge range of learning options as well as live courses where you can also get certificates after completion of the course. Since both Google Cloud and Amazon are so popular these days, you must have some sort of familiarity with all of the technologies. This will give you a major boost when it comes to the process of hiring. When it comes to Amazon, the web services here are something that will definitely help you become much more familiar with the technologies. Google also gives you platform training opportunities which you may use freely. It may also be used for training partners around the world. GitHub may be used for some inspiration whereas Rackspace will help you understand the cloud scene at the same time. Here are some of the best job opportunities that come with cloud computing system! The job of a cloud architect is tough. Here you will be expected to boost the development as well as the implementation of cloud-based initiatives to make sure that all the systems are reliable, secure as well as supportable. They could help in achieving business objectives which are related to budgets. You are expected to have a degree in computer science or become an engineer. Some of the big responsibilities which fall under this category include having a new and open relationship with the environment, building a consensus and having a comprehensive plan which needs to be backed by a business case. You have to be able to facilitate events and choose all the important tools which are needed to validate the business. A degree in business administration will also do in cases like this. A cloud software application engineer has to have a masters or PhD in the field of computer science or any other field of engineering. You need to have five years of experience which should be equivalent to distributing the programming models. Some companies also expect you to have a good idea about software development. The demonstrated skills include familiarity with some basic stuff such as Linux internals, software development environment, debugging skills and experience with topologies. Jobs like this also expect you to show some enthusiasm when it comes to social media networking. Working as a cloud solutions executive will make you slog like no other. You have a huge range of responsibilities here. Firstly you have to be able to qualify the security solutions, have excellent cloud computing services as well as be able to identify those which are driving to the enterprise. You have to be able to participate in some of the local IT groups and develop on the business plans as well. It is also crucial to leverage all the solutions as well as the resources so that you can exceed the value expectations of the customer. A cloud software engineer is one who is responsible for the development as well as the design of the software models which are distributed. They also tend to integrate with several cloud service platforms. Experience is also needed when it comes to the infrastructure of cloud computing, experience in SOA technologies as well as the ability to provide the right ETA for all software modules. Most candidates who want this job need to have a degree in software engineering with some work experience in development from before. Being a part of the cloud sales team expects you to be a cloud sales representative, cloud sales consultant or even a cloud sales manager. In this, you will have to grow and develop on the cloud business with the help of professionals of C level and some of the enterprise level customers. Also since you are a part of the business field you will be expected to travel around 50%. If you think you can handle something as strenuous as that, then you may take up this job. However, you will have to have a degree in business administration with about 5 years of experience. In order to become a cloud services developer, you have to design as well as built a platform which includes sales interfaces as well as management portals. It will also expect you to have a degree in computer science with over five years of experience. You have to be able to work with SOA platforms and have some good experience when it comes to Agile, Java, Python and C++. There are several courses when it comes to cloud computing. If you find it too hard to study in a college, then take up cloud computing courses online. Here you will get a wide range of courses out of which you can pick one. This will help to become a cloud computing expert. Here are a couple of things that will let you get started! This course is basic and free. As the name suggests, you will learn about the basics, its usage scenario which includes security as well as its infrastructure basis. In cloud academy, you will be able to learn things from the very basic to specific skills that are advanced. Not only that, the cost of this course is hardly expensive. It will be done within $59. This is offered in the University of California and doesn’t cost you more than $650. Here you will be allowed to focus on cloud-based solutions such as Amazon, Google and Microsoft technologies. There are over 21 different modules that cover everything from basic stuff to the most complex and advanced ones. Cloud School is one that will help you become an expert. Even if you don’t have much experience, you may try this! The highest paid cloud computing jobs are located in a certain part of the states. In places like Chicago, New York and Washington, you will be making over 118 thousand dollars a year provided that you work for 41 days. However, most of the jobs also depend on the post you have. In the commercial department, you will be paid around a hundred and forty-six thousand dollars roughly per year. In java software you will be given a hundred and twenty-three thousand dollars whereas a cloud architect will get a hundred and fifteen thousand dollar salary a year. This brings the post to a close. We hope you have found some great help through this post. Those of you who have wanted a job in cloud computing have to do a course at first before taking up a job. And it is only after a few years experience that you will be able to become a cloud computing expert. If you have liked reading the post and have some feedback to give, please feel free to comment in the box below. We would love to hear from you. On that note, good luck!